The status will be reflected with all the required information such as where exactly the train is right now, between which two stations, whether it is running as per schedule or late and what is the expected time for arrival and departure at any train station. The latest train status is reflected via an accurate GPS tracker and navigation system, providing accurate real time status for the travelers. Both estimated time of arrival and departure are updated real time and shows the live running status of a train. How live train status can help us? It is very important to track your train location online because most of times Indian Railway Trains run late or not as per the schedule. Passengers may need to wait for a long time on the railway station, which is very annoying for anyone. 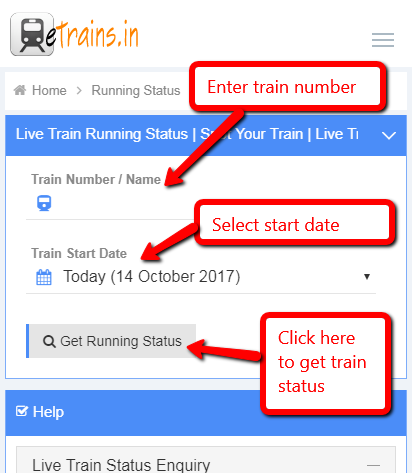 If passenger already checked running status of train online before leaving for station then they might not go to station if the train is running status late. Passengers will go to the station on time as they knew the expected arrival and departure of train along with the train delay time. Things which are important to be noted while checking live train status are Last Updated Time, Current or Last Reported Station and Estimated Time of Arrival (ETA) at the station. Current Station indicates the station based on which the current live train running status is resolved. It also shows that the train has either arrived at or departed from the station. Estimated Time of Arrival (ETA) shows the expected time at which the train is supposed to arrive at station. Easy way to change the name of the passenger in the e-ticket.IRCTC (Indian Railway Catering and Tourism Operation) now offers the flair of changing name of e-ticket passenger. This can be done at the near railway reservation office, declared IRCTC on its official website - irctc.co.in.